Noida, (21/1/2019): The Aqua Line Metro remains to be a question in the minds of people, as the metro is supposed to be inaugurated on 25 december, but due to some problems the inauguration ceremony got postponed and now likely to be done on 25 January. The NMRC have done every arrangement for the inauguration ceremony, yet no written document have been issued by the administration that the inauguration will be done on 25th January. Uttar Pradesh Chief Minister, Yogi Adityanath will be inaugurating the Aqua Line Metro. After the inauguration, he will board the metro from Greater Noida and will travel till Sector 142 metro station in Noida. Regarding the Aqua Line Metro’s Inauguration, Ten News Team visited the NMRC Office in Sector 29, Noida, to have a special conversation with the NMRC, Executive Director, P. D. Upadhyay. “NMRC is only responsible to make the metro operational and we have done our work, the delay is not from our side. The administration is deciding about the inauguration ceremony and we are waiting for their response to inaugurate the metro”. When asked about the ‘One City One Card’ , he said, “One City One Card is a dual chip card which will be launched on the day of inauguration. This card will help the commuters in buying the tokens of metro and later on it will benefit people with shopping also, as people can do shopping with this card. The card was made with association of State Bank Of India. This card will also give discount of 10% on every token”. On the question, what will be the arrangement for the commuters to exchange between the blue line metro of Delhi and Aqua line Metro, he said, “Right now the commuters have to take metro feeder bus service or public transport to reach to the sector 51 metro station to take the Aqua Line Metro. 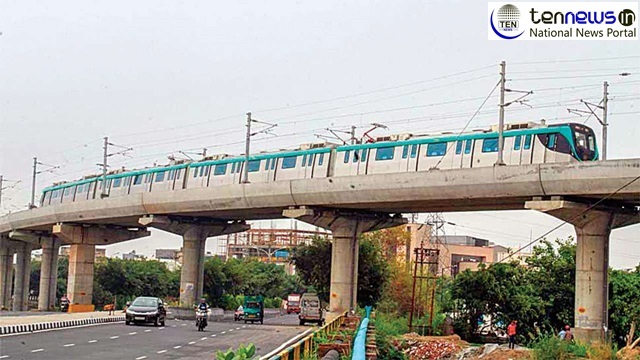 But after the Noida Extension Metro Project is completed, the blue line will connect to the metro station of Sector 52. We have built a walkthrough between sector 51 and 52 metro stations which will help the commuters to exchange the metro”. When asked about the date when the general public can use the metro, he said, “the metro will become operational for the general public on 26th of January, after the inauguration ceremony”. Now we will have to wait and see that this 25 January can bring the commuters with some relief or it will also shatter the hopes like the 25th of December.